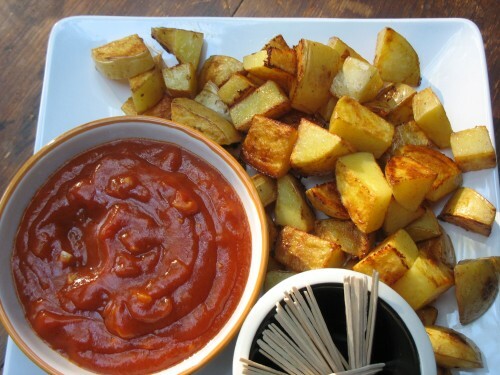 Patatas Bravas (Roasted Potatoes with Spicy Tomato Sauce), is probably the most common tapas dish in Spain. Its status has been elevated in recent years by upscale chefs who create their own unique, signature variations. Sometimes the sauce is mixed with the potatoes; sometimes it is served on the side as a dipping sauce. And a creamy white sauce for patatas bravas is not uncommon. Gambas al Ajillo (Shrimp with Garlic) is a very popular, classic Spanish tapa. These simple garlicky shrimp are easiest to eat when served in individual small bowls. Warm-up the serving bowls while preparing the shrimp. Serve with slices of crusty, country-style bread to dunk in the juices. This is also tasty over hot cooked pasta as a main dish. Not exactly tapas, but yummy just the same! Preheat oven to 450ºF. In a large bowl, stir together olive oil, salt and paprika. Peel potatoes if using russets. Cut into 3/4 to 1-inch bite-size pieces; add to bowl and stir to coat. Transfer potatoes to a large rimmed sheet pan, about 11×17, and spread out on pan. Roast 10–12 minutes. Remove pan, loosen and turn potatoes with a metal spatula. Continue to roast 5 to 7 minutes more or until potatoes are nicely browned and can easily be pierced with a fork. Make sauce while potatoes roast. In a 1-quart saucepan, cook garlic and onion in olive oil over medium heat for about 5 minutes. Stir in tomato sauce, seasoned rice vinegar, cumin and cayenne. Increase heat and boil 5 minutes or until slightly thickened, stirring occasionally. Serve with hot roasted potatoes and toothpicks. Remove shells from shrimp, keeping tails on. Remove vein along back of shrimp. If using frozen shrimp, thaw according to package directions and remove shells. In a medium bowl, stir together seasoned rice vinegar and cayenne pepper. Add shrimp and toss to coat. Cover and refrigerate for 20 to 30 minutes, stirring several times. In a 10 to 12-inch skillet sauté garlic in olive oil until garlic just starts to brown. Add shrimp and marinade; stir and cook until shrimp turn pink. Divide shrimp and juices among individual small bowls or ramekins. Serve immediately with fresh, crusty bread. I love tapas! And one of my favorites is Gambas al Ajillo. It’s so simple and so satisfying. And I love how your Spicy Tomato Sauce looks! Yes, tapas are delish! Susan if you’ve had patatas bravas, was the sauce on the side or where the potatoes tossed in the sauce? Did you have them in Spain or…? I like sauce on the side because the potatoes stay more crisp. I haven’t had the patatas bravas yet, but you’ve motivated me to try them! I would definitely want my sauce on the side too. And I can think of a few other uses for your great sounding tomato sauce. Just tonight, my husband was scrounging around our cupboards for some chili sauce for his fried shrimp. This would have been perfect!